It was the perfect night to have dinner on the patio and just as we were about to serve...the sky turned to shades of pink. The temperature was just right to enjoy a dinner of corn chowder and crusty warm bread. You can see the glow from the pink sky reflecting on the white bowls. Lobster and corn soup with fingerling potatoes and fresh chives. 1. We removed the corn from 5 ears of corn and sauteed the corn with one onion, chopped and two garlic cloves, minced in olive oil. Season with salt and pepper. Cook for about 35 minutes or until corn is tender. 2. In a large pot of water, bring to a boil the reserved corn ears cut in half and the lobster tail shells. Simmer for 30 minutes and strain through a fine sieve removing everything but the liquid. You will use about 6 cups of this as fish (lobster) stock. 3. Once the corn and onion mixture is ready, in small batches puree the corn mixture and stock in a blender. Remember to remove the cap on the lid of the blender and cover with a heavy dish towel. Reserve about 1/2 cup of the corn mixture to add texture to the soup. 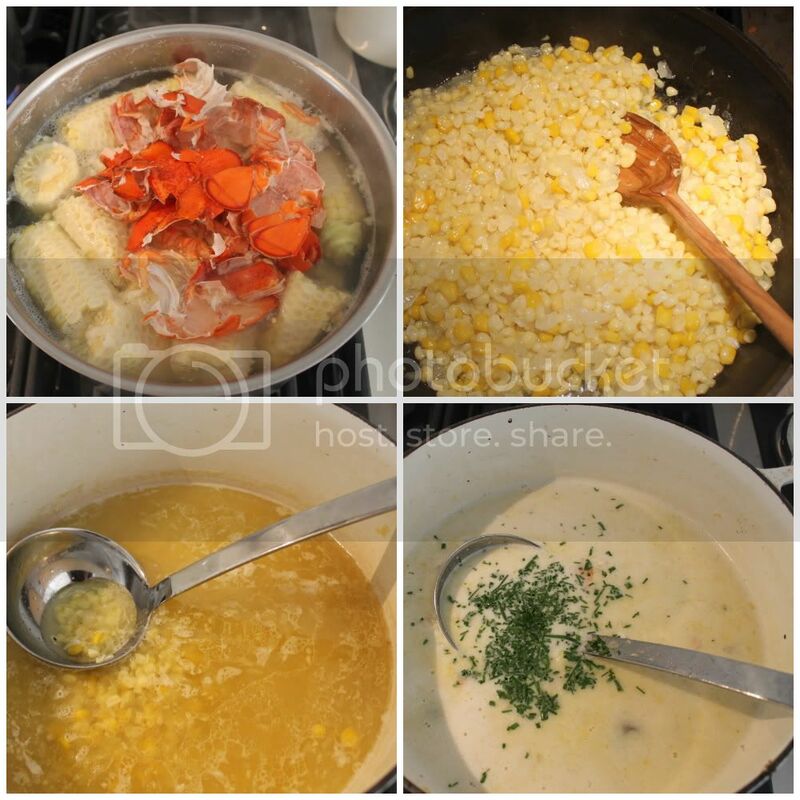 Return to the pot with the reserved corn and add the cooked lobster tail meat cut into bite size pieces. 4. Cook small potatoes just until fork tender, drain and cool. When cool enough to handle, cut into half or quarters depending on size and add to the soup. 5. Cook over medium heat until warm. Stir in chives and season to taste with salt and pepper. Note: We used frozen lobster tails. We added the shells to the water with the corn husks to make the stock. This cut down significantly on the prep time and the soup still had wonderful flavor. Fresh corn, fingerling potatoes, onion and garlic from the farmer's market and chives from the garden. I will definitely try this recipe when we find good lobster. It looks exquisite! This is spectacular! I'm doing it! This both looks and sounds delicious. How lovely to have eaten dinner outside looking at that wonderful Tiepolo sky which, in itself, exudes all the warmth of a summer night. The pink of the sky reflecting in your bowls! Your al fresco dinners look so fabulous. I do miss that experience. Some of our best memories revolve around outdoor meals with family and friends. No bugs! And the most beautiful nighttime scents from the garden. The farmer's markets are such a joy to shop at this time of year with all the fresh local produce. I like the collage effect that you have used here too. The soup looks amazing! I could eat bowls of that and not ever tire of it! Oh my gosh! That soup looks so very appetizing. I just had my breakfast yet I suddenly find myself very hungry! I love the way to you set tables - you are very skilled at that. Your soup looks very delicious. Thanks for your wonderful recipe. I might want to try it out one day. And I like your table setting, it's very lovely! P/S: Come by and enter my giveaway for a chance to win a personalized jewelry! This has to be one of my favorite posts! I can't decide which I long for more........ the yummy soup or the pink sky! I adore the photo of the white bowls with the pink reflection! You have gotten so talented with your camera! Thank you for sharing such an amazing photos and recipes..... everything looks delicioussss. Your table decor is always stunning. I like the braided placemats. Where are those from? so pretty! the food and the sky! can I live with you ? haha.. I don't enjoy cooking but I want your food! Beautiful.. food , photos settings just perfect!! Yum - the chowder looks amazing - looks like a wonderful night! This looks incredibly delicious, the perfect light supper for a summer evening. Thanks for sharing the recipe. I have some fresh corn in the fridge...I might just try this out! ohhh! what a nice colours in the sky and in the cups!! I love how you have decored your table! such a wonderful recipe! I'll definitely try it!